from the new collection 2018 of Viktor&Rolf - well, I wouldn't. 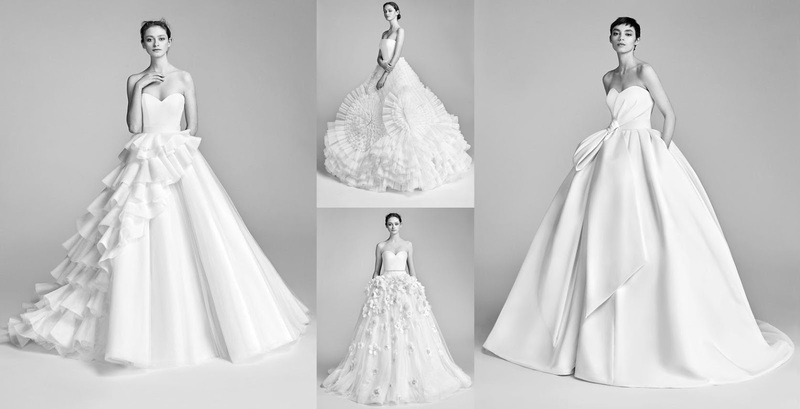 For Marriage Spring/Summer 2018 fashion artists Viktor Horsting and Rolf Snoeren continue their evolution of bridal wear, with each dress in the collection presenting an individual, autonomous character, each with her own striking silhouette. The offering, comprised of graphic A-line dresses, elegant column dresses, voluminous ball gowns, sharp tailored jumpsuits and flirty short dresses. 'Minimal' is rarely a word used to describe Viktor&Rolf 's Collection. The dresses are so beautiful, elegant and out of this world. They really created dreams! I will definitely bookmark this in my head if the big day ever comes along in the future. The collection is produced in partnership with Justin Alexander, an international bridal wear designer and manufacturer. The new Eau de Toilette has juicy top notes with a burst of pomegranate accord, bergamot and mandarin oils. In the heart, Flowerbomb Bloom continues the iconic Flowerbomb floral bouquet containing Centifolia Rose, Sambac Jasmin, India Osmanthus and Cattleya Orchid, but with new added pure air molecules. The base is strong and memorable with musk, vanilla and patchouli.